A 40-day, cross-country manhunt for an inmate who robbed Motel 6 in Morro Bay ended Monday at a homeless services center in Oregon. 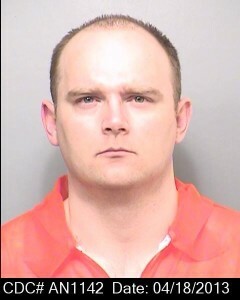 Joshua Lee Drinnon, 36, escaped captivity on Sept. 2 and disappeared into an Illinois cornfield. Drinnon, who is a California inmate, was being transported cross-country at the time. Authorities found Drinnon on Monday morning in Ashland, Oregon and arrested him without incident. The arrest occurred at a resource center for the homeless and people in need, according to the California Department of Corrections and Rehabilitation (CDCR). In 2010, Drinnon robbed a Motel 6 clerk at knife point. In 2012, he received a 17-year prison sentence for robbery, which was his second strike. Drinnon had been serving the 17-year sentence at the Richard J. Donovan Correctional Facility in San Diego. Prior to the escape, authorities transported Drinnon to Tennessee for a court appearance in which he received a six-year sentence for aggravated robbery. Drinnon escaped while on the way back from Tennessee. The inmate managed to get out of his restraints at a rest stop on Interstate 80 about five miles outside Princeton, Illinois. Drinnon ran past the transporting officers and was last seen scaling a fence and running into a cornfield. Inmate Services Corporation, which was contracted through the Sullivan County Sheriff’s Department in Tennessee, was transporting Drinnon. Local authorities in Illinois searched for Drinnon for a couple of days. They then suspended the search because they had no new leads. The CDCR Office of Correctional Safety and the United States Marshal Service then formed a task force responsible for finding Drinnon. Members of the task force determined Drinnon was in Oregon and made the arrest. Drinnon was scheduled to be released to parole in May 2025. He then would have been transported back to Tennessee to serve the sentence for aggravated robbery. CDCR officials say 98.5 percent of inmates who have escaped from adult institutions, conservation camps and in-state contract bed facilities have been apprehended. Would love to know how the homeless shelter knew he was a fugitive. Would love to know why in the heck the powers that be in SLO are so hell bent on building a 200 bed facility here. “Authorities found Drinnon”… “The CDCR Office of Correctional Safety and the United States Marshal Service then formed a task force responsible for finding Drinnon. Members of the task force determined Drinnon was in Oregon and made the arrest”. Where did you draw the inference that the shelter knew anything? Just curious….